1. Mix all the dry seasonings together and set aside for later. You can purchase Carne Asada seasoning in the mexican food section of most large grocery stores that will work ok.
2. Heat your grill and once it is ready place the strips of steak on the grill and sprinkle the seasoning mix generously on the meat. The meat will cook very fast since it is thin. You will need to turn it once. Be sure not to overcook the meat or it will be dry and tasteless when it comes time to eat. 3. Chop the cooked steak in to roughly bite sized pieces. 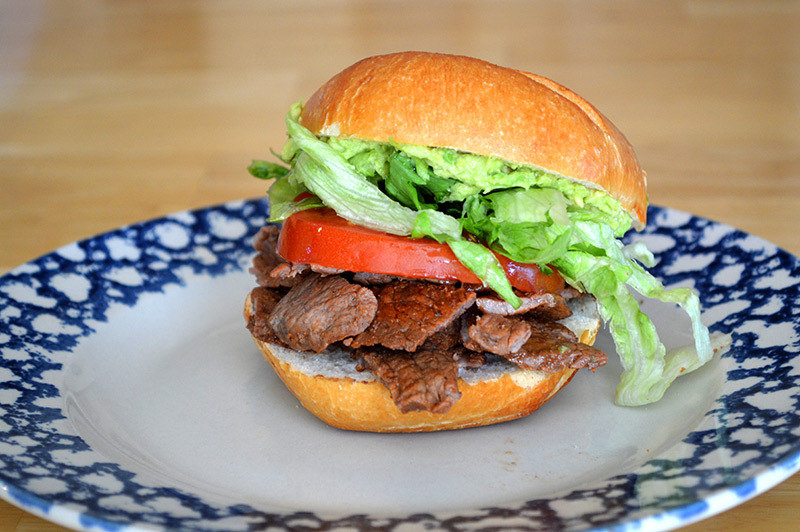 Put the steak, sliced tomatoes, lettuce and avocado on the bread and serve. Talk about an explosion of flavor, this is one of those dishes where I found myself sneaking bites because I just can’t wait to eat it. Tortasare basically sandwiches with a Mexican slant. If you don’t have a grill or are short on time you can make this on your stove top but if you want the real experience you’ll cook it on the grill. These are easy to make and make a great addition to any Cinco de Mayo party.